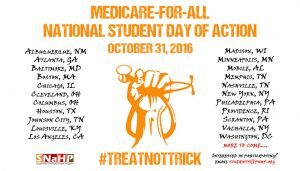 NATIONAL DAY OF ACTION: This Halloween, let’s treat, not trick, our patients! Despite living in an era of great potential in the fight against disease and death, Americans continue to be haunted by health care profiteers. This Halloween, hundreds of medical and health professional students around the country will call on candidates and elected officials to abolish private health insurance, and to replace the health insurance industry with an expanded and improved Medicare-for-all. This national day of action, dubbed #TreatNotTrick, is organized by Students for a National Health Program (SNaHP) and supported by well-known health professional student organizations such as the American Medical Student Association, The Latino Medical Student Association, White Coats 4 Black Lives, and the California Health Professional Student Alliance. #TreatNotTrick will be an opportunity to put pressure on candidates to include improved Medicare-for-all, or “single payer” health insurance, in their platform just one week prior to the November elections. The decision to organize this national event was made after the success of SNaHP’s “TenOne” day of action in October 2015. 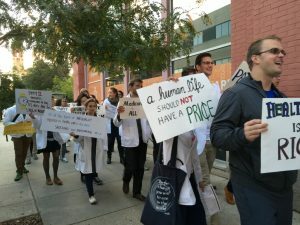 During that event, more than 35 actions were organized at dozens of medical schools, and many groups received local media coverage. There isn’t a week that goes by without a scandalous headline highlighting the broken quality of health care financing in the United States. Recently, mega-insurer Aetna backed out of the Affordable Care Act’s marketplace exchanges in 11 states, significantly reducing access to care in several portions of the country. Shortly after, there was public outcry over a 600% price surge of the life-saving EpiPen by big pharmaceutical company Mylan. There is a better way to provide care for everyone while also controlling costs: Improve and expand the existing Medicare program to cover all medically necessary services, and enroll everyone from the day they are born. The timing of #TreatNotTrick is critical. The outcomes of this year’s election will set this country’s political priorities for the next four years or more. A unified call for improved Medicare-for-all so close to the election will demonstrate that affordable, accessible health care for everyone is only possible with single payer. Not only do the majority of Americans want it, but the current system will buckle without it. The editors of this blog urge all medical and health professional students to add their voice to this call and to get involved by joining or organizing a #TreatNotTrick event this Halloween. Questions about #TreatNotTrick may be directed to students@pnhp.org.